Total German Shepherd: Well, I can honestly say that I've never seen a German Shepherd Dog or a German Shepherd puppy carry it's tail quite like your girl. German Shepherd tail carriage is very indicative of many things such as status, but even so, this is a new one on me. I don't know if any of the other readers have any experience with this but typically German Shepherds carry their tail out from their bodies - almost like a sabre - fairly straight but with a curve in the middle of it. Not curled up over their bodies like a Pug or Basenji. Sorry I can't be of any more help about the tail carriage of your puppy but I can assure you that this is not normal tail carriage for a German Shepherd. She is as cute as a button though! If you're happy with her and if she's happy and healthy, ultimately that's all that matters anyway. Good luck with your new German Shepherd puppy. In the German Shepherd breed, there is a disorder called Curly Tail Syndrome. When a Shepherd has this disorder, it does exactly that, curls. Possibly, your pup has CTS and is a purebred shepherd. Hope this helps! Looking at the picture it seems as if it's "FIDO" one of the puppy I got, he is in his 7th week of age and very aggressive. "NEMO" other also has a curl but nt so prominent. I checked with a vet. doctor and all I got were the words of wisdom. "They are like kids and since they cannot speak they convey by different means- the tail may be up due to dominance, excitement or as u said both of them fight all the day and play may be because of too much activity...give them time to develop features and they will change and evolve." I have two German Shepherds that have the curled up tail, they are half Siberian Husky, they look purebred German Shepherd in every way except for their beautiful tails. Your little girl most likely is mixed w/Husky. German Shepherd/Siberian Husky Hybrids are often called Shepsky's, by whatever name they are the best of both breeds and are wonderful gorgeous dogs! Well she is now 13 weeks and her tail no longer curls at all. It has a slight curve but does not curl like a piggy tail. 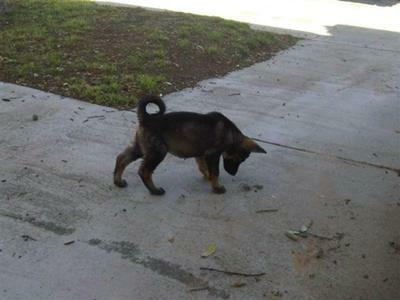 i am by no means an expert, however i have never seen a tail like so on a german shepherd. Maybe he has Akita in him?